We went to the mountains this last weekend for a Valentine Getaway. I love being able to escape for a couple of nights this time of year to the mountains. It often snows. Watching the snow fall, cuddled up with a blanket, a good book and a roaring fire is a perfect scenario. 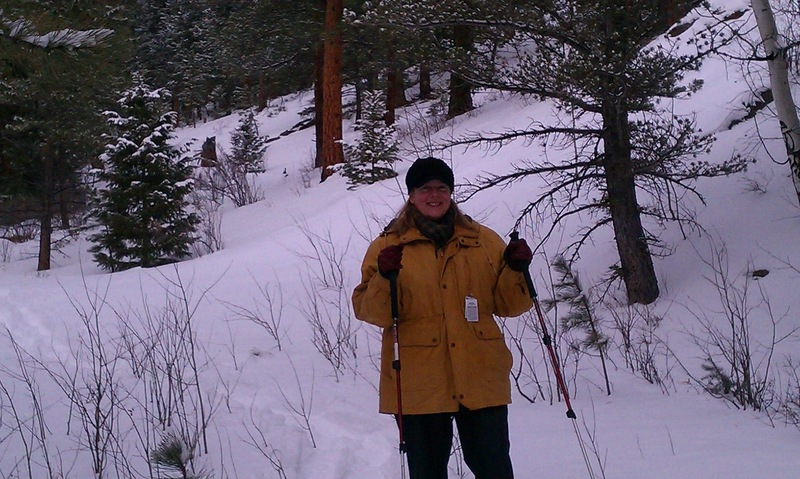 It is also fun to take a hike in the snow. 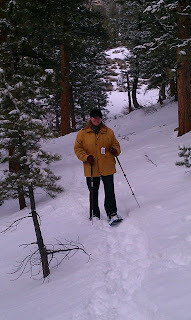 I had never really snowshoed until a couple of years ago. I am not a skier. I never really liked it. But I do like the snow and to get out in it for fun. The world looks very different covered in snow. There is a special kind of quiet that winter snow brings to the world. 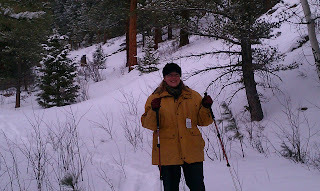 My husband and I went out on a great snowshoe hike on Saturday afternoon. It was cloudy and looked as if it would snow before the afternoon was over. We were lucky, it didn't start snowing until the end of our adventure. I feel so confident in snowshoes. With the cleats on the bottom of the snowshoe I feel secure with every foot step. You also don't sink into the snow...you can glide on top. I use poles for even more steadiness...but they are not necessary. I have discovered you can climb in areas not possible in the summer time. One time when my husband and I were snowshoeing in Rocky Mountain National Park we realized as we peaked a summit that we had climbed up a waterfall that gushes alongside one of our favorite paths during the summer. It made us feel very cool and accomplished! For those of you who have not yet had the thrill, I recommend it. I found a great website dedicated to snowshoeing. The link will take you to a page that guides first time snowshoers in picking the right gear and getting prepped for having fun! Enjoy!